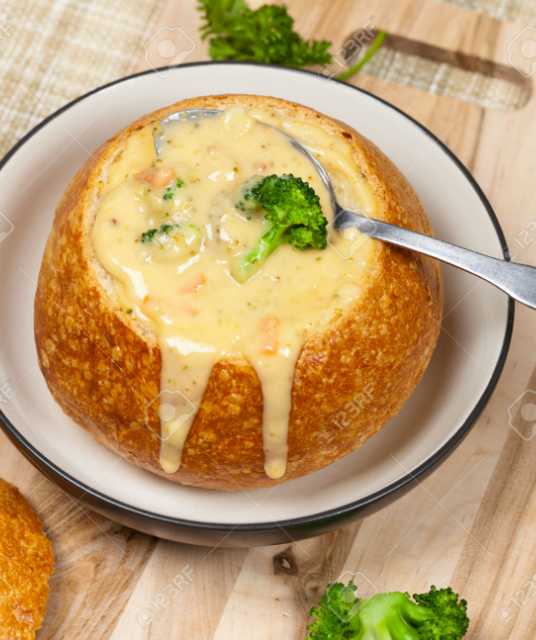 Begin this recipe for slow cooker broccoli cheddar soup by heating a large skillet over medium heat. Once hot, melt the butter and sauté the celery, onion, and carrots until soft. Stir in the garlic and flour, using a whisk to fully combine. Continue whisking the skillet while you add the evaporated milk. Season with salt and pepper and continue cooking for about two minutes. Transfer this mixture into your slow cooker. Add the chicken broth and broccoli florets. Cover and cook on high for three hours or on low for six hours. After your soup has cooked, stir in the heavy cream and all of your cheeses. Turn off your crockpot and serve once all your cheese is melted. Serve in a bread bowl or with a side of fresh baked bread.